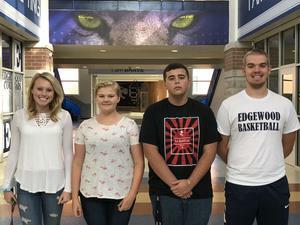 EHS students Rylee Rosenfelder (9th Grade), Cayla McNamara (10th Grade), Landon Zimmerman (11th Grade) & Blake Perdue (12th Grade) were nominated for the Cougar Character Trait Award of the Month. These students were selected by EHS staff for going above & beyond our expected Character Traits behaviors, both in class and outside the classroom. Congrats to these Cougars!